and in most cases, partners with an equity investor to complete its projects. 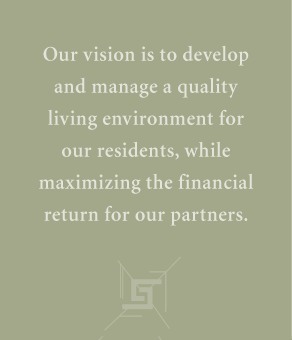 Synergy utilizes a variety of funding sources, including conventional financing and the 221(d)4 and 232 HUD programs. Synergy has developed multi-family projects under the HUD programs over the past ten years, which offer high-leverage, non-recourse financing throughout construction and the permanent loan term with only one closing. While there are many benefits to the program, one financial benefit is the fixed-rate forty (40) year amortization period that reduces the annual debt service, increasing cash flow. The 221(d)4 and 232 programs provide developers and investors the opportunity to develop market-rate product with conventional type financing, insured by HUD. The program is NOT a rent-subsidized program requiring affordable or low-income housing. Synergy has also refinanced projects through Freddie Mac and continues to look for competitive financing in the marketplace.